Quarterly GDP slows in EMU in the Q1 and also slows in all the original EMU members that are early reporters – Spain excepted. Growth also slows in the United States and slows sharply in the United Kingdom. More broadly, year-over-year growth slows everywhere in Q1 2018 except in the U.S.
For a broader historic comparison, we can look at GDP growth rankings since Q4 1997. On that score, current year-on-year growth ranks at about its 83rd percentile in both the U.S. and EMU. France and Italy find growth in the 69th percentile of their respective historic queues. In Belgium, with a ranking in its 53rd queue percentile, its growth is barely above its historic median (which falls at a ranking of 50). Spain’s growth is in its 44th percentile and despite being the strongest of the lot in absolute terms, it is also the relative weakest in the EMU when ranked in historic profile. Italy shows two consecutive quarters of weaker year-over-year growth. Spain shows three although with very marginal slowing. The U.K. shows growth slowing for four consecutive quarters. Yet, during this stretch, the Bank of England has begun to hike rates. On the other hand, the U.S. shows year-on-year growth accelerating for eight straight quarters despite two consecutive quarters of slowing quarterly growth. Despite the slowing in GDP, the March unemployment rate has fallen in six of 11 of original EMU members (Greece lags). The unemployment rate is unchanged in the other five. Unemployment rates are still falling on a very widespread basis nearly everywhere, and on all horizons in the table: over three months, six months and 12 months. It is too soon to tell if the trend declines are still in place or if the equivocation in the tendency of unemployment rates to fall in five members is a new signal of a new direction or a signal of the end of a trend. Unemployment rates have dropped below historic medians (since January 1991) in all members except Austria, Italy, Luxembourg and Greece (Greece, with a 2-month lag). But unemployment rates have not yet dropped decisively into the lower third of their respective ranges in Portugal, Ireland or Spain. Finland and France remain just outside their respective lower quartile. Germany, Belgium and to a lesser extent the Netherlands show extraordinary low rates of unemployment. On these data, the U.K. is the policy dilemma. While the Bank of England does not have to wrestle with conditions in other countries to set policy, it is facing at home weak GDP growth and a pronounced slowing in GDP’s trend and yet a historically low rate of unemployment. U.K. inflation has begun to settle down, but it remains over the target (set by the BOE at 2%). The U.K. still faces an unknown Brexit future with perhaps a slightly more lenient attitude from Europe but with important unresolved issues and a split point of view on who’s in control of the negotiating process back home. That’s a tough policy environment to negotiate. 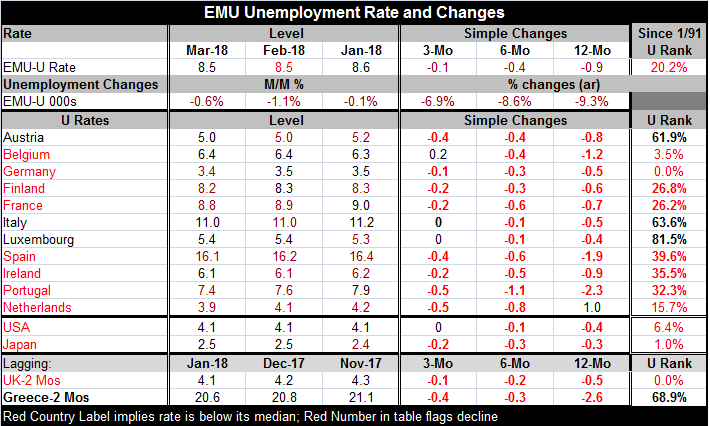 In the EMU with inflation still under target and unemployment rates all having fallen - but not of them being low- there is a bit of a policy dilemma as well. The EMU GDP slowdown is still quite new and may only be a statistical artifact. However, the broad based consolidation of unemployment rates at last month’s levels in the EMU may be another cautionary signal about growth prospects. In recent forecasts monitored by the ECB private sector estimates of inflation have been cut but the outlook for growth has not been affected. And the ECB is one-trick pony focused on inflation. On balance, central banks remain on their course to raise rates. Recently, ECB President Mario Draghi has admitted to there being some slowing in the EMU but called the slowdown temporary. Still, it is rather widespread and Asia still has not really gotten into the acceleration mix at all. China continues to struggle to some extent as does Japan. Can Europe be so sure of the outlook? The U.S. still carries the most momentum, but it has back-to-back quarters of slowing. However, it also has inflation in its official incarnation coming into the Fed’s target zone. Will the Fed become emboldened about policy while the ECB faces more growth uncertainty? If that happens, you can look for the dollar to slingshot higher, and then, all growth bets are off. There are still a lot of uncertainties about growth and there is a very uncertain back drop for geopolitics. U.S. President Donald Trump seems determined to continue to push to get better trade terms. Meanwhile, the EU, with Jean-Claude Junker as its spokesman, said today that it would not negotiate under pressure. At this point, that is a little bit like being under water and refusing oxygen. I don’t see Trump backing off to get the EU room to breathe and to negotiate. Maybe this is plain justice as the EU is getting some its own medicine in terms of how it has treated the U.K. over Brexit. Any way you slice it, there are a lot of relationships that have defined trade and polices in the Post War period that are now being derailed for various reasons. It’s hard to argue that the U.S. does not have a case for unfair and discriminatory treatment. But it’s also easy to see how the world trading community does not want to change the deal it has had with the U.S. Still, that does make the conditions of trade under the last 30 years the right standard by which to judge what rules and behavior ought to govern trade in the future. As countries clash over trade and geopolitics, there is the ongoing question of how much confidence will be lost and what that will mean for growth everywhere in the coming quarters.